The MWS Foundation will host the 3rd International Family Conference on June 25-27, 2020 in Houston, Texas. Milford, CT – A fun evening of tennis and prizes is on tap for September 29 at Milford Indoor Tennis (580 Bridgeport Ave.). 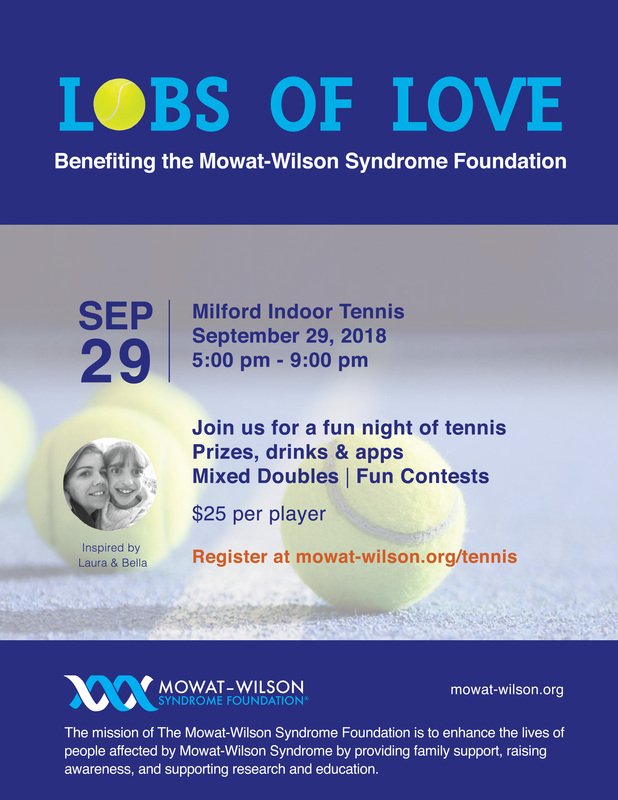 The Lobs of Love Event will benefit the Mowat-Wilson Syndrome Foundation. Mowat-Wilson Syndrome is a rare but extremely serious condition found in many countries and across ethnic groups. In Connecticut, five children – two of whom live in Milford – are known to be affected by the disorder. Experts estimate that hundreds of U.S. children are affected by Mowat-Wilson. The Foundation is raising funds to hold a medical conference on the syndrome in 2020. Significant signs of the syndrome include distinctive facial features, intellectual disability, delayed development and other birth defects. Lobs of Love attendees will enjoy a fun-filled evening featuring round robin mixed doubles and serving competitions. A silent auction and raffles are included, as well as appetizers and drinks. Event organizers are seeking donations of goods or services as well as financial contributions. The Foundation hosted three great regional events in 2018. Regional events are informal events where the families get together in a relaxed and fun setting to exchange experiences and get to spend some time together. As of March 1, 2018, the Mowat-Wilson Syndrome registry has over 133 participants involved at varying levels with the three current surveys. With the launch of the Growth Data survey we hope to be able to provide the valuable information necessary for the development of Mowat-Wilson Syndrome specific growth charts. “Individuals with Mowat-Wilson syndrome (MWS) frequently are small compared to other people their age. This means that when a provider tries to plot that person’s growth (weight, length/height, and head circumference) on typical growth charts, the person with MWS appears to be small. Sometimes the person seems very small or the person’s growth is not on the typical growth chart at all. When a person’s weight is below what is expected for age, physicians often become concerned that the person is not getting enough calories, and this can sometimes lead to unnecessary procedures, such as placing a feeding tube when a feeding tube is not needed. For this reason, we hope to develop growth charts that are specific to individuals with MWS. Our goal is for these growth charts to be available for people of all ages and include weight, length/height, and head circumference. This will allow families and providers to know if the person with MWS is growing as expected. If, indeed, the person is not growing as well as expected for a person with MWS, then the provider could appropriately recommend treatment for the growth issues. If you are already participating in the registry, you just need to sign in to access the surveys. If you have completed Survey #1 – Baseline Information, you will then be able to proceed directly to Survey #4 – Growth Data. It is not necessary to complete surveys 2 & 3 first. For those new to the registry, you will be required to complete an initial registration, establish your privacy settings and complete Survey #1 – Baseline Information before having access to complete the Growth Data Survey. All MWS families invited to a great night of music, friends and fun! This study , published by the American College of Medical Genetics and Genomics, analyses clinical data for 87 patients with a molecularly confirmed diagnosis of MWS, including 62 previously reported patients and 25 unpublished cases, and compared them with patients previously reported by other authors. The data was obtained through collaborations involving clinicians from various countries. Such primary data have never been collated from a large cohort of affected individuals. In this article we present a comprehensive study of MWS features underlining a highly consistent phenotype for the disease, its genotype–phenotype correlations, and the phenotypic and clinical evolution taking place with age. The purpose of the article is to assist clinicians to identify the disease and to provide them with updated care recommendations for patient management. You don’t have to spend much time with a person who has Mowat Wilson Syndrome to figure out that his or her love for life is key to who they are as individuals and how they bring us together as a community. As parents raising children with special needs, we often hear people remark with appreciation about how it takes a village to raise a special child. In our Mowat Wilson community, I think the opposite is also true. When we involve our children in the bigger world around them, the community benefits and learns from them as well. People may get involved in one way or another out of kindness or a willingness to try something, but what often happens, as the relationship develops, its richness is as beneficial to the community as it is the person with MWS. No one teaches us that more than Christian Sell. Christian, a young man with Mowat Wilson Syndrome, is 25 years old. He lives at home with his mom and dad, John and Wendy. He loves to hang out with his brother Justin, who is his biggest advocate. The love between them is obvious to anyone who meets them. Their relationship is a model for any siblings. The bond they share is one we see frequently with our MWS siblings. Many of us met Christian at the Mowat-Wilson Syndrome Foundation Conference in Washington DC last June. 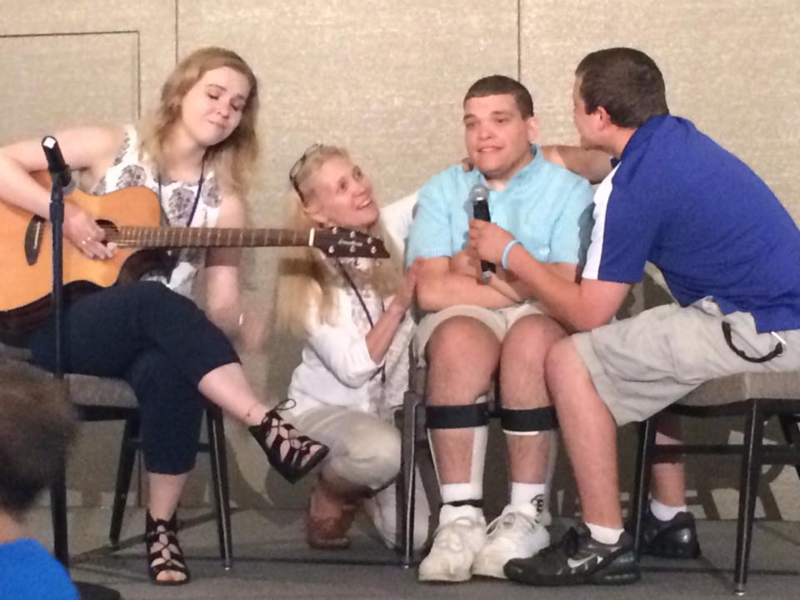 Christian sang a Beatles song with Justin and his cousin Kathlynn, who was at the conference speaking to us about music therapy. If you were there when Christian sang, you know there wasn’t a dry eye in the house! Christian’s speaking and singing words were remarkable and it certainly gives us hope that our kids “will get there” one day too, but there was more to it. It was a familiar song sung in a group of people with common ground. The connection was strong. After hearing Christian sing, I heard many people, myself included, talk about how their kids like to sing, with or without words. Music is something Christian loves to share with his brother. I challenge anyone to watch Christian’s and Justin’s car karaoke and not laugh out loud! Shared on our MWS facebook group, this YouTube video rivals any James Corden carpool karaoke episode. It shows a willingness of both brothers to live in the moment and share a simple pleasure. I also admire Christian’s devotion to his local hockey team, the Norwich University Cadets. One of Christian’s first questions for anyone he meets is “do you play hockey?” When I met Christian, he asked me and told me about his love of hockey. Having attended almost every home game since 2000, Christian has developed a personal relationship with the team and its ever changing group of young men. Over the years, he has also become friends with hockey players on many opposing teams even going to watch games in Maine, New Hampshire and Massachusetts when his Norwich players are playing teams on which he has befriended players. One of the local papers wrote a great story, highlighting his connection with the hockey community. When Christian was hospitalized for 9 days with Sepsis pneumonia in early 2016 some of the NU team visited him in the hospital. During the visit Christian invited them to his house for a cookout. Later that year, the entire team showed up at Christian’s house for a great day of food, fun and laughter! I think that the relationship that Christian has with this team can be played out in one way or another in all of our communities. I realize this commitment happens with a lot of support from friends and family. Over the years Christian and his family have become close friends with 1964 The Tribute, “Best Beatles Tribute on Earth” according to Rolling Stone Magazine. In January they will be attending their 50th concert in 20 years! Here too, Christian has developed close friendships, not only with the band, but also many other people who also attend shows regularly. 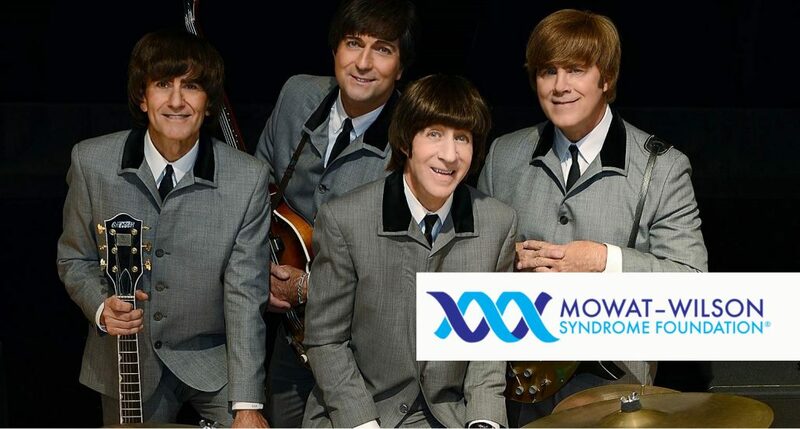 This friendship is the foundation for a large Mowat-Wilson Syndrome Foundation fundraiser being held in Christian’s hometown of Barre, VT next May featuring 1964 The Tribute as the musical entertainment! In the little bit I know about Christian, I see his appreciation for the simple things in life. His approach is beautiful and humbling in many ways. I think Christian reminds all of us to sing and cheer as loudly as we can and make the most of everyday. 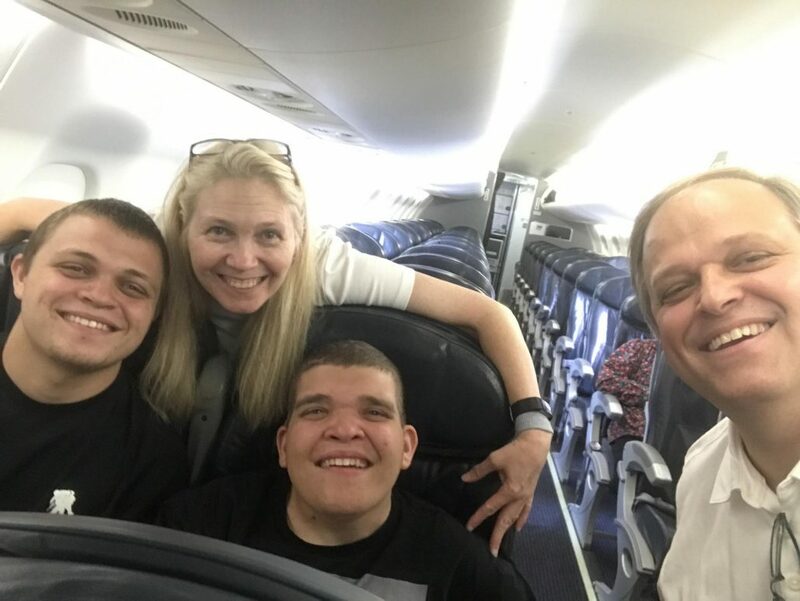 Take a look at the Sell’s slide show of their trip to Washington DC for the 2017 Mowat-Wilson Syndrome Foundation Conference. Let it inspire us all to get out there and participate in the world around us! John and Wendy Sell are board members of the Mowat-Wilson Syndrome Foundation. They bring an incredible value to the Foundation and the MWS families. Feel free to contact them.